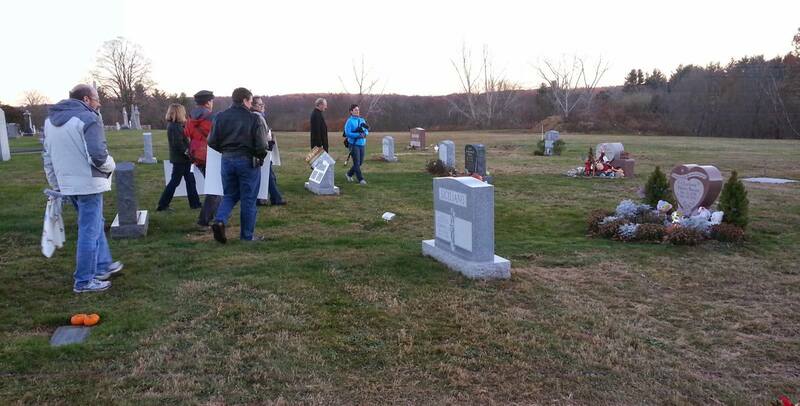 Board members visit a local cemetery with members of Trinity Episcopal Church. 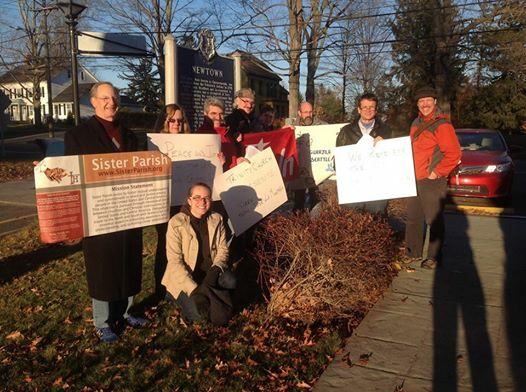 As we enter 2015 I’m reflecting on the wonderful gathering hosted by Trinity Episcopal Church in Newtown, CT for the Sister Parish Board Meeting. They are the newest linkage in the Sister Parish family, and are just beginning their relationship with San Jose la Montaña in El Salvador. Both communities have suffered from violence against their youth. Young people are being targeted by gangs in El Salvador and Trinity lives with the memories of the Sandy Hook Elementary shootings. The two communities’ support of each other made the Solidarity Walk very meaningful for all of us who participated. One of the main topics discussed by the Board was facilitating more youth on delegations, north and south. The feedback from young people going on delegations, and their communities once they have returned home, is off-the-charts (read reflections from recent delegations to El Salvador and Guatemala). Youth are able to connect in different ways, with more common interests and experiences than one might expect. Sometimes it’s as simple as realizing they enjoy the same music. Other times it’s realizing they face the same challenges with relationships, school and just growing-up. The Board will be initiating conversations with Sister Parish Committees in 2015 to facilitate ideas on increasing youth participation in the linkage partnerships. The Board also reviewed economic considerations in the regions we support. Central America is recovering more slowly from recent economic challenges than the United States. The cost of living has increased approximately 10% and rent for the Sister Parish Center has gone up 5% per annum in the past several years. The cost of transportation, security and other expenses also increased. Knowing that Northern communities had financial concerns during the economic slow-down, Sister Parish temporarily absorbed those cost increases and kept delegation costs at the same level. Discussions are underway to update the travel model for future delegations, allowing more flexibility for groups of different sizes while addressing increased travel expenses. Board members and members of Trinity Episcopal Church gather for the Solidarity Walk. The Annual Meeting is also where the Board elects Officers. Greg Huang-Dale’s term on the board will end mid-way through next year, so Nancy Wiens has been elected as Board President for 2015. Tom Pouliot will serve as Vice President, Michael Spellman as Treasurer and Ginnie Berge as Secretary. There is an opening on the Board, as I’ve completed my term (which I extended for an additional year, since it was so rewarding). If you are interested in joining the Board or know someone who would make a good candidate, please contact Carrie Stengel at Carrie@SisterParish.org for details. We are looking forward to our plans for 2015 and can’t wait to share another year with all of you. This entry was posted in Solidarity Walks, United States and tagged board meeting summaries, board member reflections, board of directors, newtown, solidarity walk. Bookmark the permalink.